Just about everyone faces a move at some point in their life. 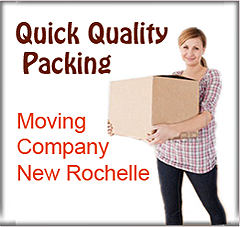 Moving Company New Rochelle is here to assist you with all your moving needs. Whether it is a college student leaving home for the first time, or a newly married couple starting out in a new house, the moving experience is something most of us know all too well. Many people expect moving to be a stressful and complicated process, that is why our licensed movers will stand by your side and provide you with a smooth and delightful moving experience from beginning to end. Our local movers and long distance movers are devoted to providing you with superior workers, utilizing innovative techniques and equipment. Our moving company will help you organize, prepare and plan your move and make sure that you understand your pricing options so that you choose the best option for you and your budget. Our licensed movers will offer you comprehensive moving tips to guide you through the preparation of the move. One of the best ways to deal with the stress of moving is being calm and organized. No one wants “surprise charges” once a move is in progress, which is why our moving company works with each customer in advance to stop this from taking place. We avoid these charges by thoroughly listing everything that needs to be moved ahead of time so that all items that are moved are accounted for. Our local movers and long distance movers guarantee their quotes and charge you a flat rate based on the amount of stuff you need to move. Request a free estimate today for your upcoming move. We have our local movers standing by and ready to assist you with all your moving needs and special moving requests. We promise you won’t be disappointed with our services. - We will call you when we are driving to your starting location; all our drivers carry cell phones. - We email or fax the itemized list to the customer so there are no misunderstandings. - We do not over book at the end of the month. - We are experienced and insured. - All our moving equipment is well maintained and of premium quality. - We are flexible to the customer’s needs and realize each move is unique. You sent me an EXCELLENT crew. They were quick and well-organized and qualified at moving heavy and challenging things. I was impressed and very pleased to recommend you to family and friends.